(21968.3, Oklahoma Historical Society Photograph Collection, OHS). The Cleveland County seat, Norman is located approximately nineteen miles south of Oklahoma City. State Highway 9, U.S. Highway 77, and Interstate 35 give the community transportation access. In the 1990s Norman overtook Lawton to become Oklahoma's third largest city, behind Oklahoma City and Tulsa. The town name honors Abner E. Norman, who led a team appointed to survey the Unassigned Lands between 1870 and 1873. His group camped where the town is now situated, and the words "Norman's Camp" were burned into a tree. In 1886–87 the Southern Kansas Railway (a subsidiary of the Atchison, Topeka and Santa Fe Railway) laid tracks through the area and established station grounds at the present townsite. As the 1889 Land Run approached, entrepreneurs formed the Norman Townsite Company to organize the town. The group had developed a plat before the event, but used the survey prepared by the railroad company. By 1890 the population stood at 787, and the burgeoning town held doctors, lawyers, hotels, and all the amenities and retail outlets of a community that size, including a cotton gin. In July 1889 Ed Ingle established the Norman Transcript, which continued to report the news at the beginning of the twenty-first century. Other early newspapers included the Baptist Bulletin, the Democrat-Topic, the Lance, the Norman Advance, the Norman Democrat, the People's Voice, the Sooner, the Territorial Topic, and the Reform Herald. In 1890 High Gate College opened, offering grammar, high school, and college classes. In December 1890 the Territorial Legislature passed an act to locate the University of Oklahoma (OU) at Norman. In 1892 OU held its first classes in rented downtown buildings. In 1893 workers completed the first university building, which fire later destroyed. In 1894 High Gate closed, and its college students transferred to OU. A private sanitarium company purchased the college building, and it evolved into the Oklahoma State Asylum in 1915 (later Griffin Memorial Hospital). By 1900 Norman's population had climbed to 2,225, and the business community boomed. By 1902 the downtown district contained two banks, two hotels, and a flour mill, among other businesses. In 1913 the Oklahoma Railway Company extended its interurban, which ran from Oklahoma City to Moore, south to Norman. In 1910 there were 3,724 residents, and the number climbed to 5,004 in 1920. By the 1920s the OU campus spread over 267 acres and had added several new structures, including Memorial Stadium. The population continued to rise, reaching 9,603 in 1930 and 11,429 in 1940. The sanitarium and university helped the community weather the Great Depression. In 1939 the Tankersley Company built the Cleveland County Courthouse, which was a mixture of Classical Revival and Art Deco elements and replaced a 1906 Solomon Layton–designed government building. World War II brought more changes to the city. In 1941 OU, with help from Norman officials, established Max Westheimer Field, a university airstrip, and the next year offered to lease it to the U.S. Navy as a training facility. During the war the airfield became the Naval Flight Training Center, known as north base, and the navy established the Naval Air Technical Training Center (NATTC), known as south base, south of the OU campus. A naval hospital was also established. The north base trained nearly nine thousand men, with the south base training thousands more. In 1946 the navy donated the bases to the university, but in 1952, with the advent of the Korean War, the military utilized the bases in a smaller capacity until 1959. The addition of the government buildings and land helped OU handle the large enrollment increase of the post–World War II era. This also allowed the city to develop, and the 1950 population stood at 27,006. Norman's proximity and easy access to Oklahoma City contributed to it being a "bedroom" community for employees who worked outside Norman proper. The population increased from 33,412 in 1960 to 52,117 in 1970. In the 1960s the city, through annexations, expanded to 174 square miles, incorporating a large land area in the Lake Thunderbird vicinity. In 1984 the community supported sixty-three manufacturing establishments, which employed 2,562. The population stood at 68,020 in 1980 and climbed to 80,071 in 1990. At the beginning of the twenty-first century Norman had 4,270 business establishments engaging a total of 47,665 workers. OU (with more than eight thousand on staff) and Norman Regional Hospital (with more than two thousand) were the two largest employers. In 1944 Norman residents passed bonds to fund the hospital. Several other institutions had extensive work forces, including York International (opened in 1981, after it purchased the defunct Westinghouse air conditioner plant), a U.S. Postal Training Center (1969), Moore-Norman Technology Center (1972), National Oceanic and Atmospheric Administration (NOAA, which dedicated a new laboratory in 1972), Oklahoma Veterans Center (occupied a new building in 1996), Sysco Food Services (1991), Hitachi Computer Products (1987), Saxon Publishers (1981), Yamanouchi Pharma Technologies (2001), and Shaklee Corporation (1978). By 2000 the population stood at 95,694. The Norman School District enrolled 12,596 students, and several other school districts (Little Axe, Robin Hill, and Cleveland County) came within the city's borders. The city offered several attractions, including the Fred Jones Jr. Museum of Art, the Sam Noble Oklahoma Museum of Natural History, the Jacobson House Native Art Center, the Firehouse Art Center, and other theaters and museums. Seventeen properties were listed in the National Register of Historic Places. 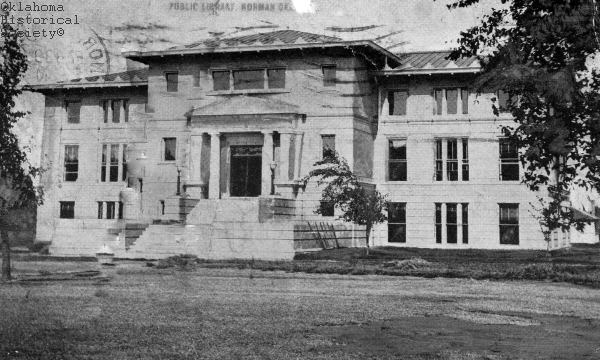 These included the Cleveland County Courthouse (NR 00001580), the DeBarr Historic District (NR 91001904), the Oscar Jacobson House (NR 86003466), the Norman Historic District (NR 78002226), the Norman Public Library (NR 00001581), the Santa Fe Depot (NR 90002203), the United States Post Office (NR 00001573), and the Moore-Lindsay House (NR 85002788), which also served as the Norman and Cleveland County Museum. University of Oklahoma's Bizzell Library (NHL 01000071) is a National Historic Landmark. Several festivals, including the Medieval Fair, Jazz in June, and 89er's Day Festival, are annually held in Norman. The city of Norman had experienced a large population growth after 2000, registering 110,925 residents in the 2010 census. George Lynn Cross, The University of Oklahoma and World War II: A Personal Account, 1941–1946 (Norman: University of Oklahoma Press, 1980). Jim Miller, A Pictorial History of Norman and Cleveland County (Norman, Okla.: Norman Transcript, 1995). Bonnie Speer, Cleveland County: Pride of the Promised Land: An Illustrated History (Norman, Okla.: Traditional Publishers, 1988). John Womack, Cleveland County, Oklahoma: Historical Highlights (Noble, Okla.: Privately printed, 1983). John Womack, Norman: An Early History, 1820–1900 (Norman, Okla.: Privately printed, 1976). Larry O'Dell, "Norman," The Encyclopedia of Oklahoma History and Culture, https://www.okhistory.org/publications/enc/entry.php?entry=NO006.